^^In this clear, pastorally oriented commentary, readers will find helpful background material on authorship, date and purpose, as well as an overview of theological themes in the Pastoral Epistles. The introductory material is followed by passage-by-passage explanation of the meaning these letters had for their first-century hearers in order to pave the way for understanding their significance for readers today. 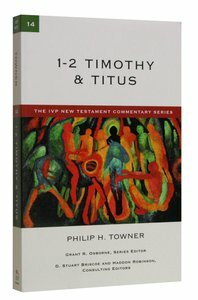 About "Ivp Ntc: 1-2 Timothy & Titus (Ivp New Testament Commentary Series)"
Dr. Philip H. Towner (Ph.D., in New Testament Exegesis from the University of Aberdeen, Aberdeen Scotland) will become the Dean of the Nida Institute for Biblical Scholarship at the American Bible Society. He was the Director of Translation Services for the United Bible Societies (UBS), based in Reading, England. He is a member of the Institute for Biblical Research, the Society of Biblical Literature, Studiorum Novi Testamenti Societas and the Tyndale Fellowship for Biblical and Theological Research. Dr. Towner is an Honourary Lecturer in New Testament, University of St. Andrews in Scotland and a Research Professor of New Testament, Biblijne Seminarium Teologiczne in Wroclaw, Poland. He is the author of many books, articles, essays and reviews including The Letters to Timothy and Titus (New International Commentary of the New Testament), 1-2 Timothy & Titus (Volume 14, The IVP New Testament Commentary Series), Jude (Volume 14, The IVP New Testament Commentary Series), and The Goal of our Instruction: Over Realized Eschatology in the Pastoral Epistles.